Some musical partnerships are so strong, intuitive and natural that they almost can’t be separated due to the natural magnetism present in the relationship. 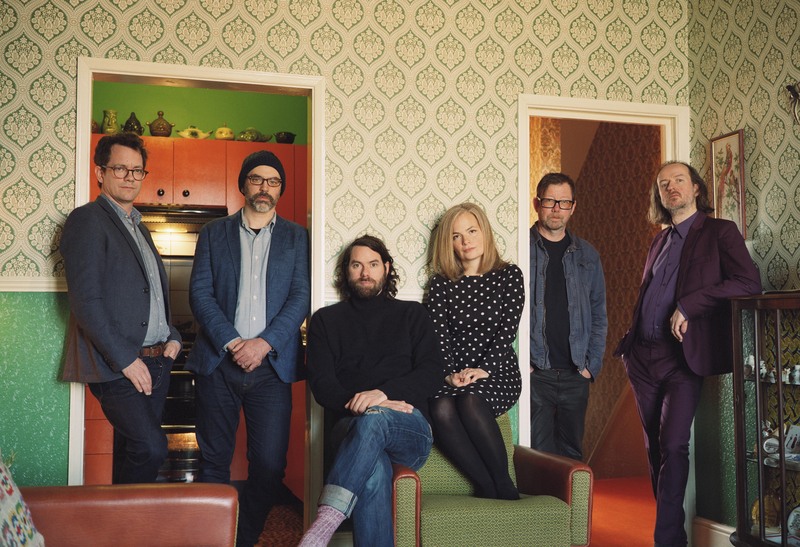 One such tight knit songwriting family are Tunng, and their new album Songs You Make At Night reunites founding members Sam Genders and Mike Lindsay (who originally started the group some 15 years ago) and the rest of the Tunng gang for the first time since 2007’s Good Arrows. Since forming in 2003 and over the course of five albums, Tunng are a group that have explored the boundaries between acoustic and electronic music, becoming synonymous with the folktronica genre before moving into territory that managed to both evade that label and continue to redefine it. They are a group that have been ever-fluid, reacting and responding to line-up changes and shifts in musical directions with a seamless grace. A re-hash of past glories this is not. Instead, what transpires on Songs You Make At Night is a group of people reconnecting with a previous collective state to bring out something new and forward-looking. It’s trademark Tunng in a sense that it marries stark intimacy and warm, enveloping textures with inventive rhythms, skipping beats and infectious melodies; yet it pushes to new, previously unexplored, depths and breadths. It’s a record that succeeds in feeling both intricate and complex in its structures but also restrained and thoughtful, allowing space where it’s needed. Something that is useful given its exploration of sleepwalking throughout. The album is a result of a group understanding the most potent aspects of its own abilities and applying them full force. “We're all so different but each bring something essential, something Tunng to the party. Be that to the studio, to the stage, to the van, or to the pub. I think that the new songs Mike and Sam have crafted between them have brought out the best in all of us.” confirms singer Becky Jacobs. The role of the other members in Tunng is crucial. Phil Winter (now also playing in Wrangler with Cabaret Voltaire’s Stephen Mallinder and a member of the John Grant collaboration, Creep Show) and his sampling skills add a unique dimension to the record, working in South Korean pop records, Planet of the Apes clips and even a speech from the 1970s pornographic actor Mary Millington. Ashley Bates brings “mind Boggling beautiful nylon string guitar parts” mostly recorded at his studio in Somerset, then thrown into the airwaves fluttering down in to Mikes basement studio in East London. “Writing those parts had such a strange and eerie quality to it “ says Ashley. It was as if they already existed and I was just uncovering them, or like I was channeling them from somewhere, or someone, else. I don’t believe mumbo jumbo, but what Mike and Sam had done obviously opened up some part of my mind I’d never seen before.” Martin Smith brings back the lost ambient percussion that was such an integral part of the early records. He also created the warmth and liquid tonal aspect of the Fender Rhodes throughout the record. Jacobs distinctive, delicate, storytelling vocals complete the picture and provide the perfect blend with Sam’s vintage Tunng tones. Songs You Make At Night is also the group’s most electronic-leaning to date, subtly used but providing the bind for the album's sprawling ivy. “The aim was to create a connection between all the songs that would tie them together,” Genders says. “No matter how eclectic we got with the song writing. It gave us a sense of structure and purpose right from the start.” The borrowed Fender Rhodes (the instrument used by Angelo Badalamenti when creating the unforgettable eeriness of Twin Peaks) became a go to instrument for connecting the record together, with its rich, mood-inducing tones. Whilst this may be the first Tunng record with Genders and Lindsay in over a decade, the pair haven't exactly been quiet. There was their lost weekend on Reykjavik harbour that resulted in a side project called Throws. Genders also released three electronic pop albums under his Diagrams guise. Whilst Lindsay continued Tunng without him, has co-written and produced work for the likes of Speech Debelle, Jon Hopkins and Laura J Martin, scored the feature documentary Mission to Lars and recently has joined forces with Laura Marling to form a new project called LUMP. But it's their special connection in Tunng, where the sparks fly and the real magic happens. Music that exists caught between genres, never settling into one specific place. Songs You Make At Night’s tone, theme, lyrics, mood and characters exist in a fluctuating state between night and day, the conscious and unconscious. Crepuscular in its nature, it is something that captures the late night activity that affects us all and spawned the name of album. Lindsay finished in explaining the all-encompassing title. "I think it’s also important to stress the songs you make at night not, we make at night. Then the word “songs” can mean a multitude of things. It can mean songs, or dreams, pillow talk or actions and decisions, moves, and can be very personal...the thoughts that keep you awake at night."